I’m about two thirds through a Stonecrop. 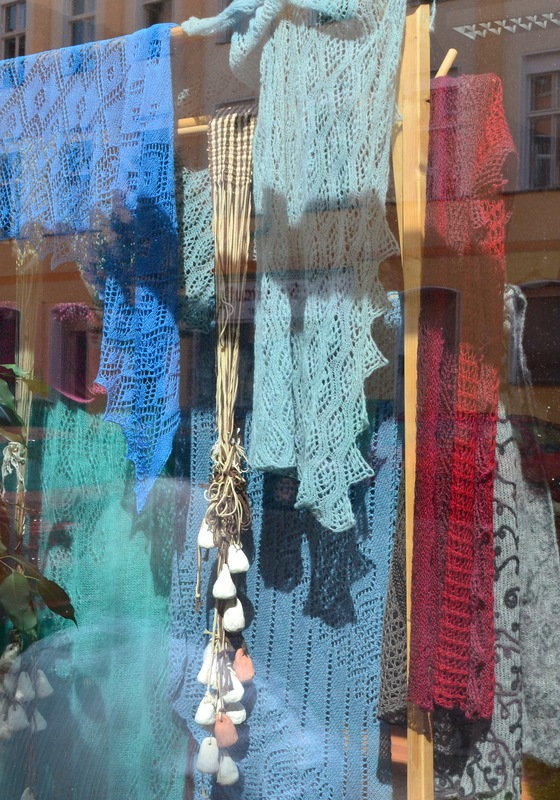 I’m not an experienced lace knitter although I can imagine myself becoming an enthusiast. There is something very absorbing about it. It’s satisfying when it’s going well – and infuriating when it isn’t. After completing a couple of projects with lacey borders Stonecrop is a step up for me as the whole thing is lace, although every other row is plain knitting. 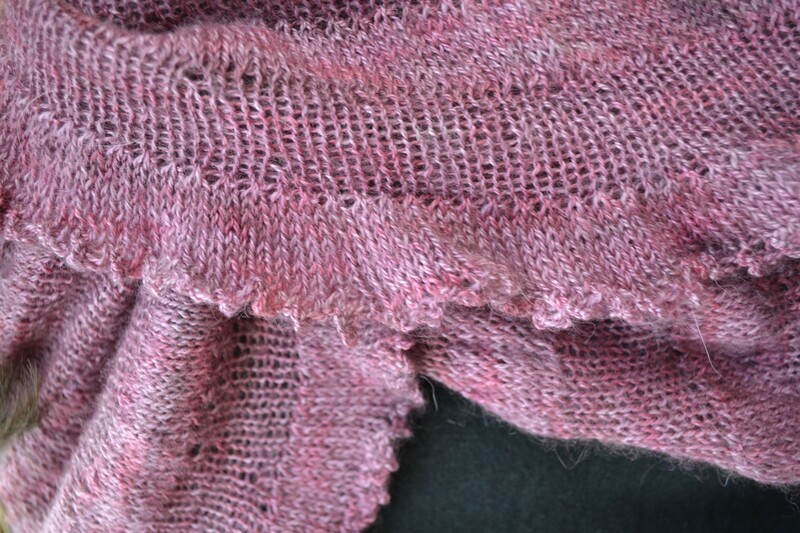 (I believe for purists ‘real’ knitted lace has no plain rows between the pattern rows.) 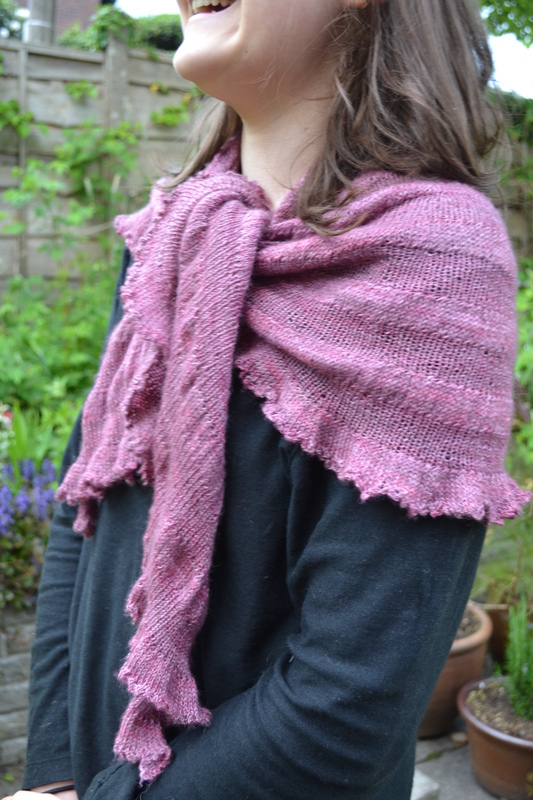 For the first foot or so of this shawl it was two rows forward and one back when I made a mistake but couldn’t work out where. All I could see was that I had too many, or too few stitches on the needle. The only thing to do was to tink back until I found a row that had the correct number of stitches. And then gradually as I got further on I noticed that wan’t happening any more. What had made the difference? I had started to be able to read the chart more fluently. I had also learnt how to see in my knitting the progression from the last few rows I had completed to the one I was working. 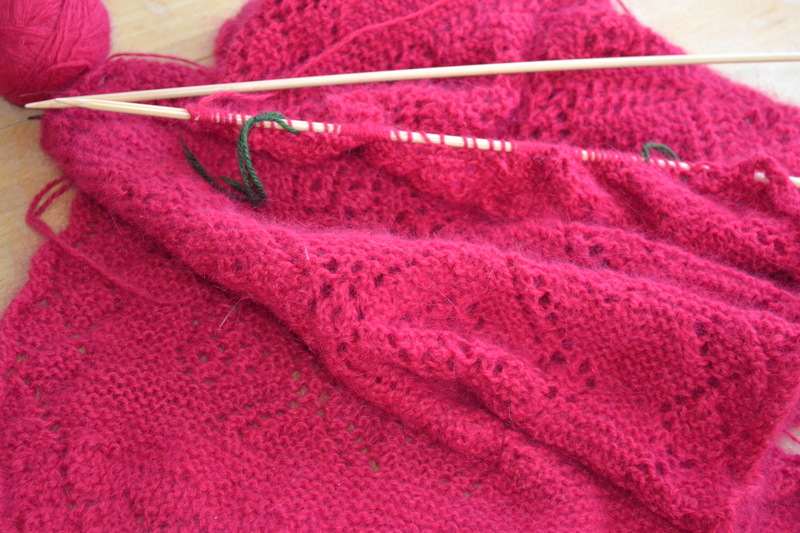 I could make the connection between, say, a diagonal row of eyelet holes to where I would do a yarn over in the current row. I was a reluctant convert to charts. I didn’t like charts! I didn’t want to use charts! Why couldn’t designers provide a line by line written pattern? Then I started to use charts. It felt difficult at first. But then I got the hang of them. Grudgingly I had to admit that all those people who tell you how brilliant charts are are right. (More about how I was converted another day.) 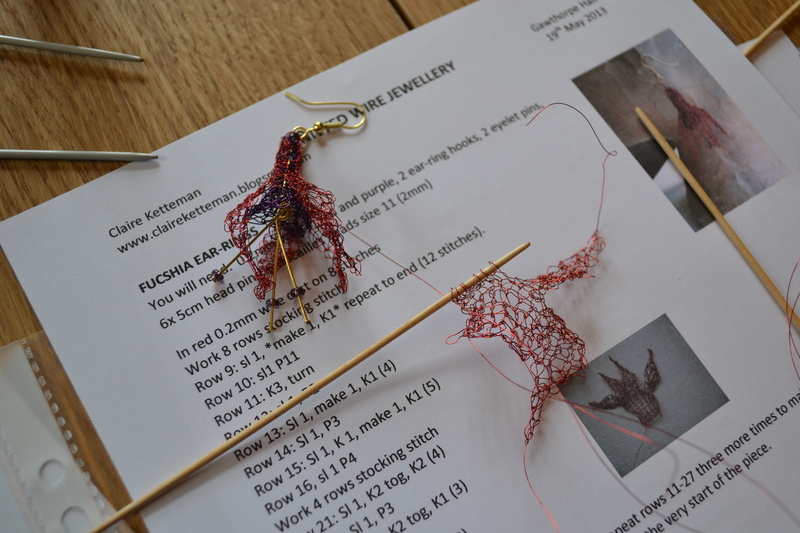 And if I am going to eventually progress from the relatively simple Stonecrop to some of the fabulous lace creations that some Ravelry members have made, getting competent at using charts is essential. But the knitting gods noticed I was getting complacent. Even as I was taking a break from composing this post by taking up the knitting again sure enough ten minutes later I found I had 50 instead of 51 stitches in the centre panel. With my newfound skills in ‘reading my knitting’ could I find the pesky missing stitch? 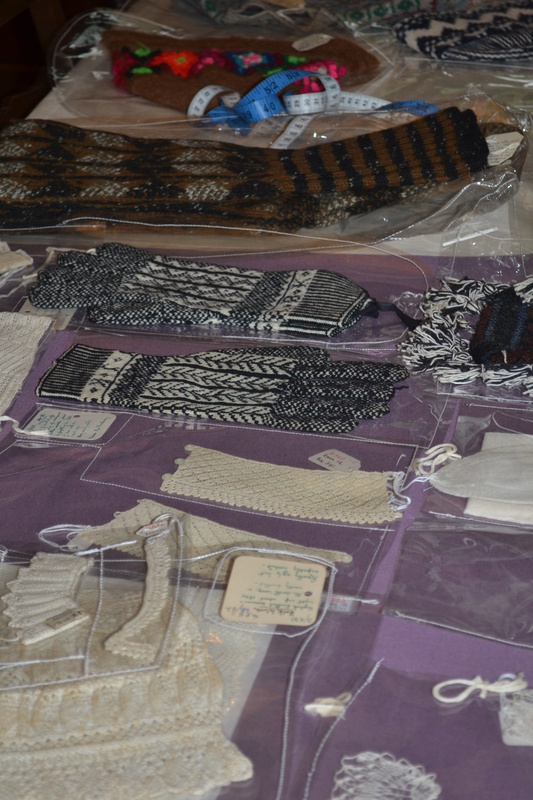 As everyone will tell you knitted lace looks distinctly unimpressive until it has been competed and blocked. This is my project in its current state. Not a particularly pretty sight. But I have faith in the transformational properties of a luke warn soak and careful pinning out to stretch the fabric to reveal the pattern. But that’s for another day – I still have a way to go on this before I get to that stage. The yarn I’m using here is a baby alpaca I bought in Florence last summer. It is so soft and warm and a beautiful shade of crimson – deeper than it looks in this photo. Autumn isn’t so far off now and I’m imagining how cosy it will feel and how it will brighten up my dark grey winter coat. 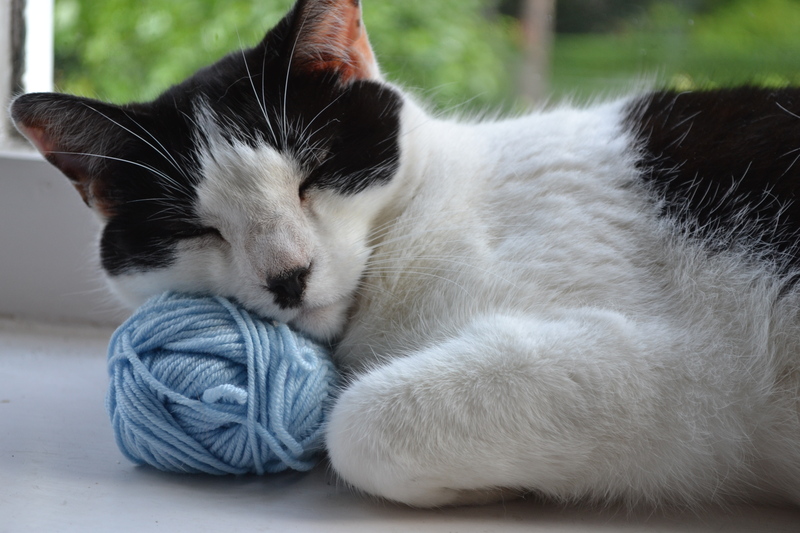 Are you knitting for winter now? I said I would show and tell from my visit to Die Woll-Lust on my trip to Berlin. 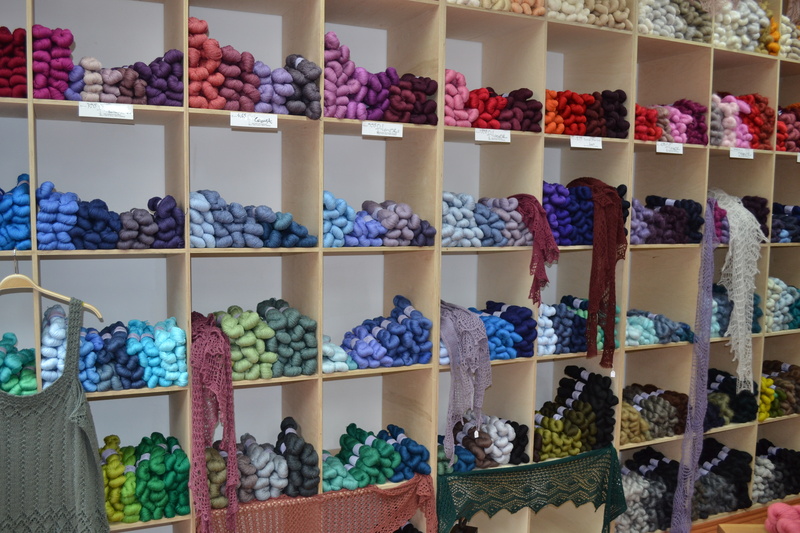 One of the things I particularly liked about the shop was the way the colours were arranged. Everywhere I looked there were enticing juxtapositions of colours. 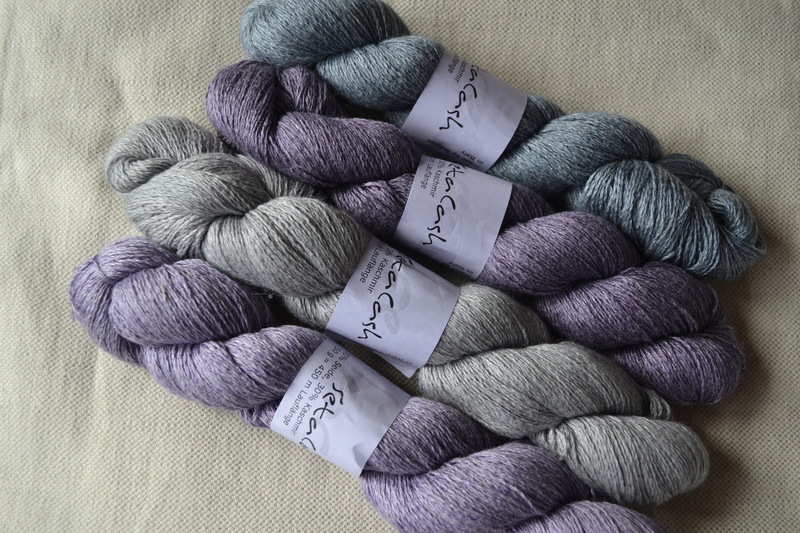 I was drawn to these gorgeous hanks of Filace Seta Cash in shades of mauves and greys. I think those colours just want to be made into a fine striped fabric. I’m not sure what to make – a lightweight cardigan maybe? But it will take a lot of knitting in such a fine gauge. While I think about it I’ll enjoy playing with the skeins, arranging them in different order. 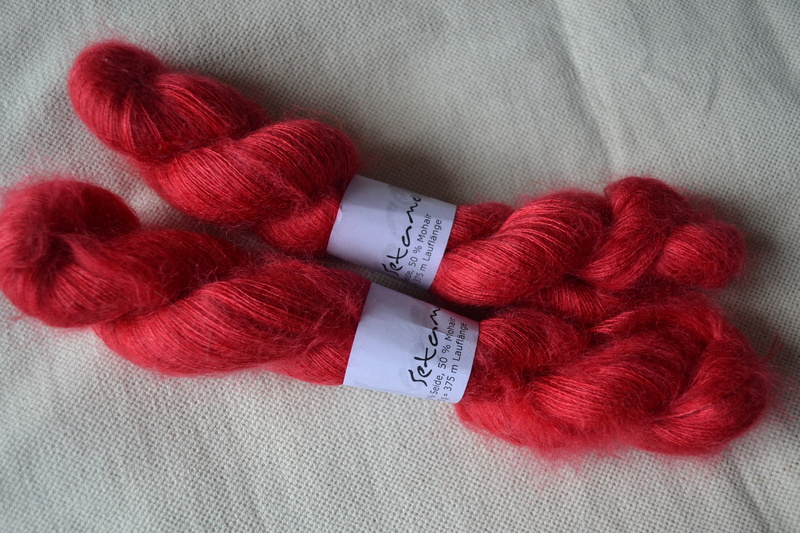 I have a weakness for Rowan Kidsilk Haze. 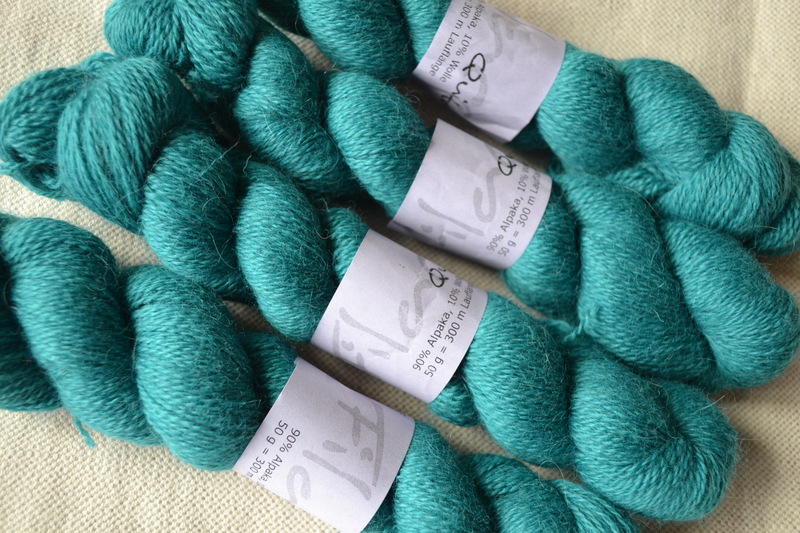 This yarn, Filace Setmo, caught my eye as being somewhat similar. It has a higher proportion of silk (50% silk, 50% mohair compared to KSH’s 30% silk, 70% mohair) which gives it a little bit more lustre at the core. Look at that brilliant scarlet! 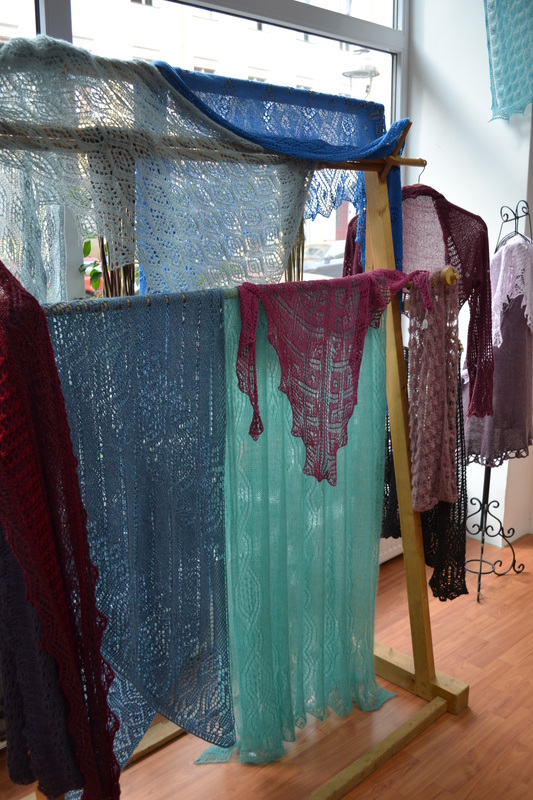 There was a lace shawl made of this yarn, Filace Quito, in a different colour on display in the shop. It had a lovely handle – soft but with a bit of body to it, as you would expect from a yarn which is 90% alpaca, 10% merino. This is a brilliant blue-green and the yarn just called out “Take me home!” How could I resist? 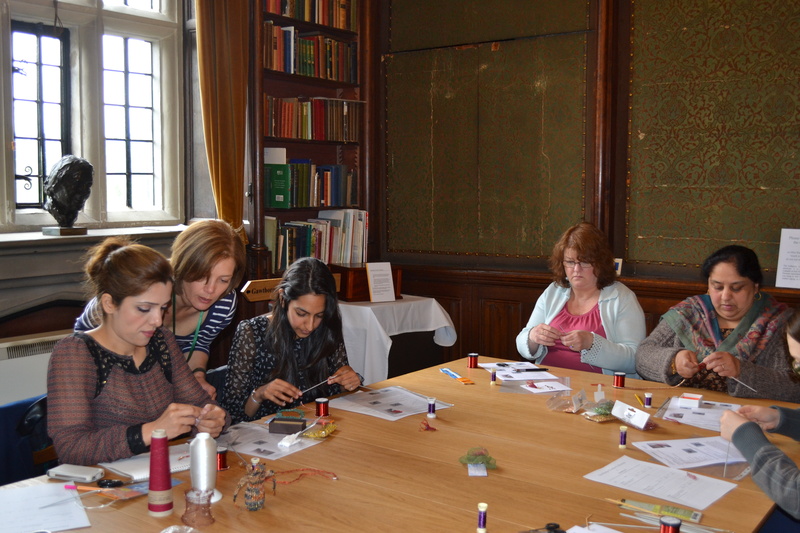 It’s not usual for me to buy several yarns at one go – I tend to buy with a project in mind. 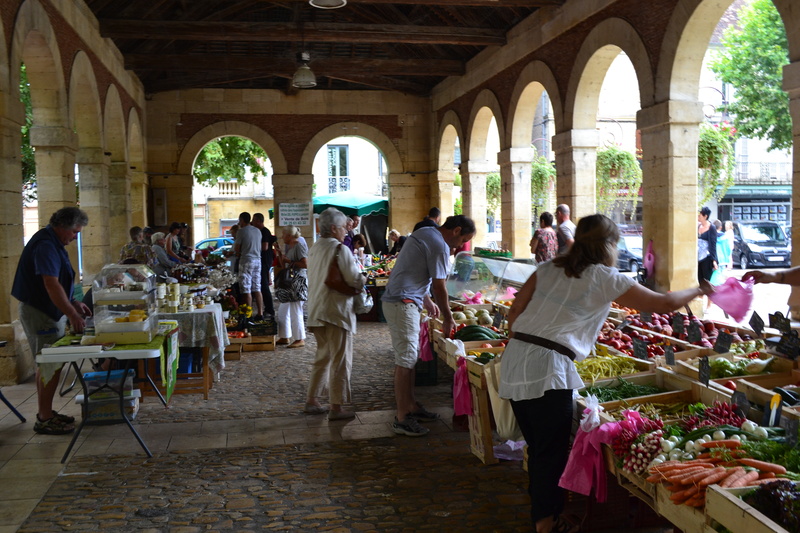 But there is something about being on holiday and knowing that I can’t pop back a few weeks later that makes me more susceptible to temptation. To leave a comment click on speech icon above left. 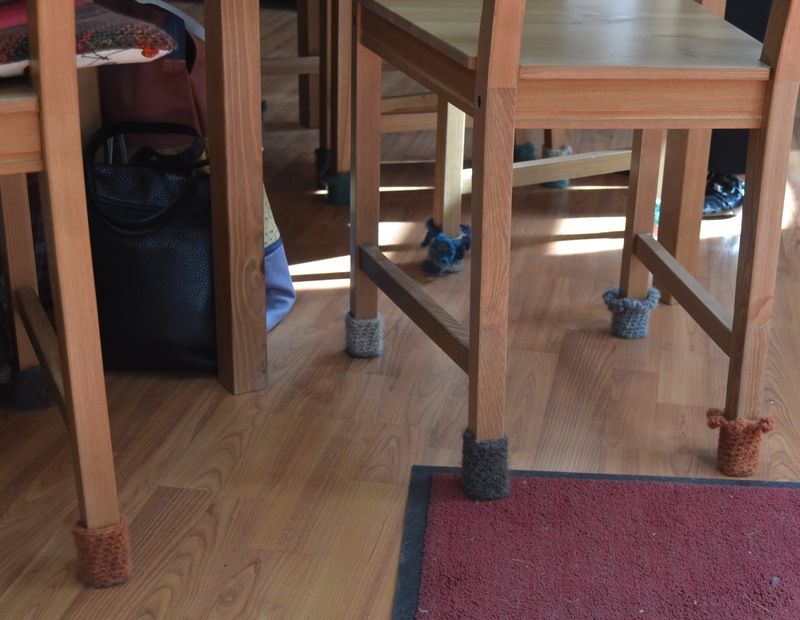 ….. that feature cutsie pictures of kitties. But I couldn’t resist showing you this. Kate Davies writes one of my favourite knitting blogs and when I was reading it recently I saw a mention that stocks of her book Colours of Shetland were getting low. I’ve been meaning to buy it for a while so I was spurred to order a copy. It arrived this morning and I’m so glad I did. 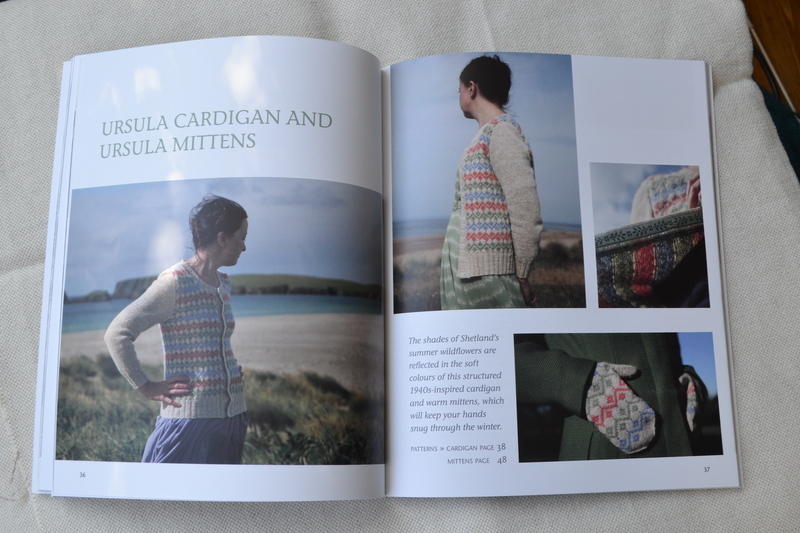 It’s a lovely book and it makes me want to do two things – knit some of the beautiful designs and visit Shetland! 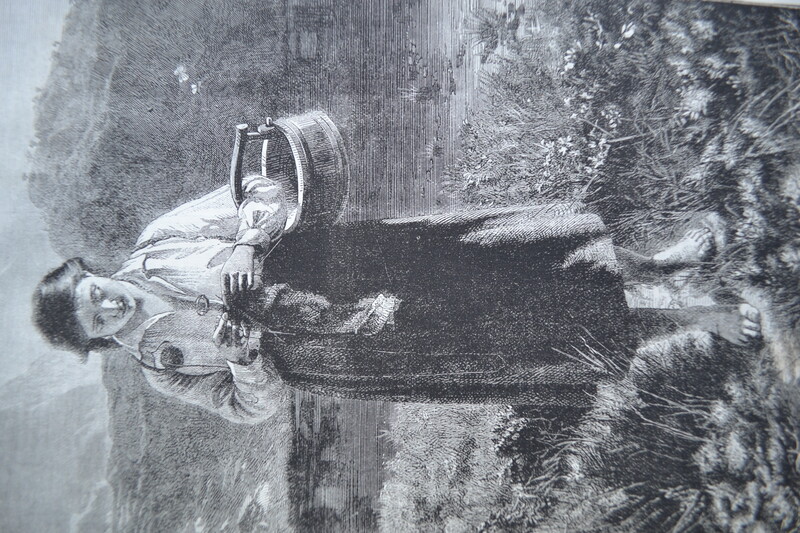 The two are closely connected as Kate’s designs are inspired by the landscape, and seascape, of Shetland and by its heritage traditions. 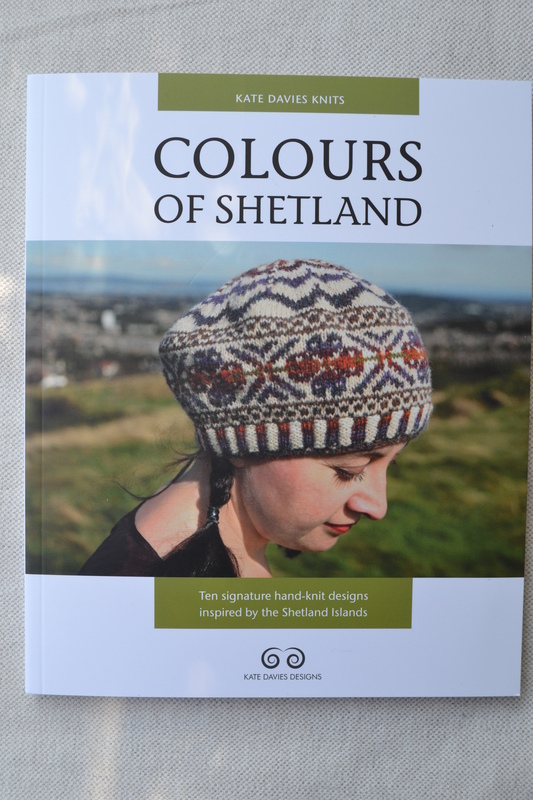 The ten patterns are more than worth the £14.99 the book costs, but an added pleasure are the stories of Shetland’s history, landscape and natural history that eloquently convey Kate’s love for the islands. 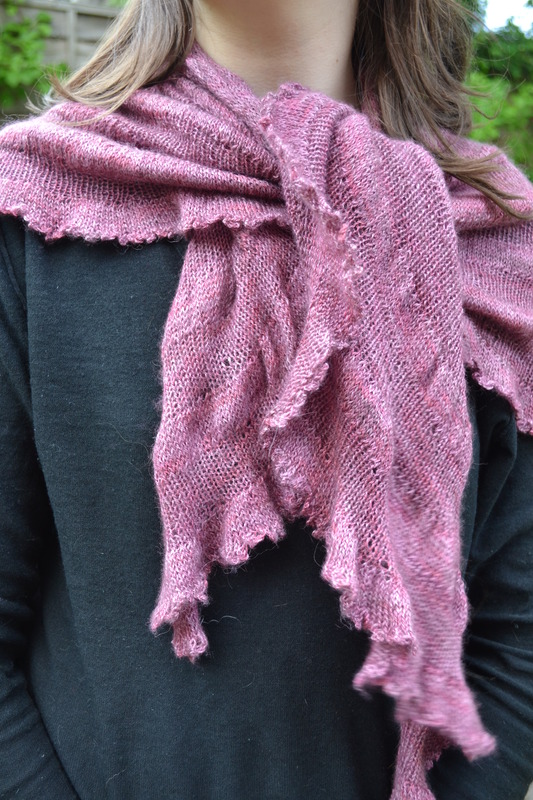 Kate uses Jamieson and Smith’s jumper yarn throughout. This genuine Shetland yarn (the company handles 80% of the wool produced on Shetland) is available in over 80 colours. 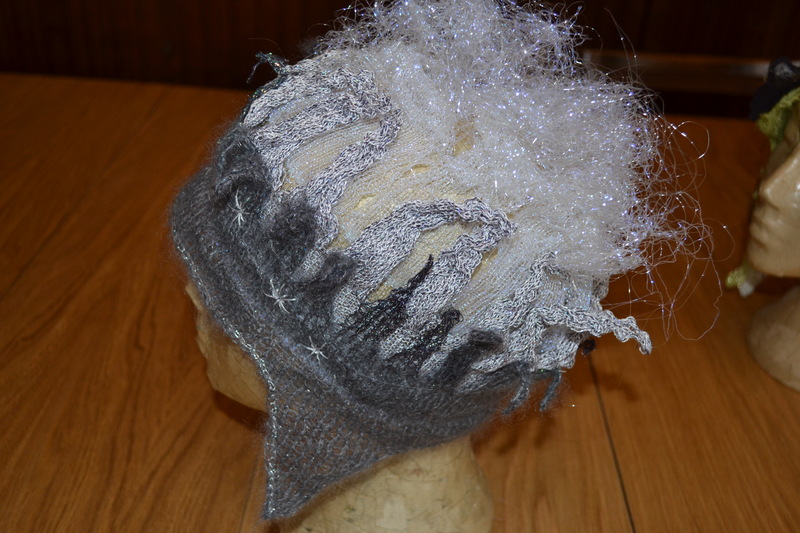 The company blog is also a mine of information about all things Shetland wooly.